CAPECANAVERAL ?President Barack Obama will ask Congress to extend International Space Stationoperations through at least 2020 but abandon NASA's current plans to returnU.S. astronauts to the moon, administration and NASA officials said Wednesday. The president's 2011 budgetrequest, due to be delivered to Congress on Monday, will direct NASA toinvest in the development of U.S. commercial space taxi services to ferry Americanastronauts to and from the station. The move is meant to reducereliance on Russian crew transportation services after the retirement ofAmerica's aging shuttle fleet. The administration willprovide for a safe fly-out of five remainingshuttle missions ? even if the final flights slip into 2011. But an optionto extend shuttle operations through 2015 is being cast aside, officials said.Obama's aim is to turn NASA once again into "an engine forinnovation," one that will spur the development of commercial industry inlow Earth orbit. The focus will be ondeveloping technologies that would enable sustainable human expeditions beyondEarth orbit. But those journeys are not likely to take place before the early2020s. Despite a fiscal freeze onmost discretionary programs, NASA's budget will be increased by $6 billion overthe next five years for a total of $100 billion. "Budgets are verytight," said former astronaut Sally Ride, who served on a presidentialpanel that determined NASA's current Project Constellation ? the post-shuttleprogram ? is on "an unsustainable trajectory." "For NASA to begetting new money over the projections is to me an indication of how seriously thisadministration takes NASA and our goal of future innovations for thiscountry." The administration hopes tocreate 1,700 jobs in Florida and 5,000 jobs nationwide, helping to offset ananticipated loss of 7,000 jobs at Kennedy Space Center after the shuttle program's shutdown. But some in Congress arenot happy. "My biggest fear isthat this amounts to a slow death of our nation's human spaceflight program, aretreat from America's decades of leadership in space, ending the economicadvantages that our space program has brought to the U.S. and ceding space tothe Russians, Chinese and others," said U.S. Rep. Bill Posey, R-Rockledge. 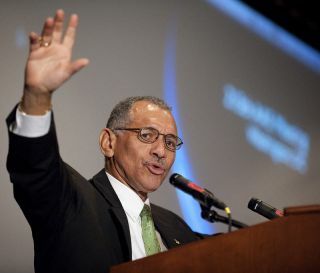 "Until we have aclearer plan for the future, the only realistic and reasonable way to preserveAmerica's leadership in space is to provide for a temporary extension of theshuttle," he said. NASA since 2004 hasinvested $9 billion in developing the Constellation program's Ares I and Ares Vrockets and the Apollo-style Orion crew capsule for missions to the moon, Marsand, in the event no commercial means becomes available, the InternationalSpace Station. The agency also planned todevelop a rocket stage to propel astronauts from low Earth to lunar orbit, anda lunar lander dubbed Altair. The idea was to returnAmerican astronauts to the moon by 2020. But the presidential panel convened byObama to review NASA's plans determined that a human lunar return was unlikelybefore 2028. The panel favored thedevelopment of commercial crew transportation services, a move that would be aradical shift in national space policy. NASA since the late 1950s has developedrockets and spacecraft flown by U.S. astronauts. "We really do believeit is time for American companies to come into this program in a way that theyhave on the cargo side for decades now," a senior NASA official said,speaking on condition of anonymity. "This is a serious,serious effort that we believe will reduce the gap" between shuttleretirement and the first flights of successor craft, the official said. Commercial crew taxi services: One of the two companies now under NASA contract to launch cargo to the International Space Station -- SpaceX -- will be operating at Launch Complex 40 at Cape Canaveral Air Force Station. Acompetition presumably would be held to select a company to provide commercialcrew transportation services, and it's almost certain that KSC and CapeCanaveral would be among the launch sites considered. Senioradministration officials said the commerciallaunch services ? both cargo and crew ? are expected to result in more newjobs and a higher launch rate on the Space Coast. Ahigher launch rate would be good for business throughout Brevard County (whichincludes the Kennedy Space Center), particularly in the tourist industry. Extending space station operations through 2020: NASA officials, U.S. Sen. Bill Nelson, D-Orlando, and others aim to secure payload processing business for extended station operations. Scientificexperiments and cargo all must be prepped for launch, and it makes sense tolocate that business near the launch site. No moon missions: The Obama administration aims to ramp up NASA's technology development programs, which have atrophied over the last several years, and make "strategic investments" at KSC, according to a senior administration space policy adviser. The idea is to turn KSCinto a "launch complex of the future," making it increasinglyattractive to commercial space launch companies, the adviser said. Technology developmentefforts, some of which might focus on building heavy-lift launch vehicles,would be conducted at KSC along with other endeavors that would enable eventualhuman expeditions beyond Earth orbit. Obama's space plan will bea hard sell in Congress. Even ardent Obama supporters and some key spaceadvisers are taken aback. "If some of thereports about the president's plans for NASA's budget are correct, it woulddecimate the space program," a Nelson spokesman said. NASA's planned return tothe moon is behind schedule because about $12 billion budgeted for the projectwas not appropriated by Congress during the past six years. But Project Constellationenjoys strong bipartisan support in both the U.S. House and the Senate, andCongress will have a big say in the plan for NASA. The JointFinance-Appropriations Committee passed legislation in December that requiresbroader congressional approval to change NASA's existing exploration program. "I think that's theintent of the language," said U.S. Rep. Suzanne Kosmas, D-New SmyrnaBeach. "It does give us hopefully some ability to weigh in." Posey said, "Thisissue is far from over." Published under licensefrom FLORIDA TODAY. Copyright ? 2010 FLORIDA TODAY. No portion of this materialmay be reproduced in any way without the written consent of FLORIDA TODAY.